No big news today. Randy Edsall said no new injuries have arisen over the last few days. The team continues its business-like approach to each game, even after a bad loss two weeks ago. Punt protection was addressed during practice more than any other special teams facet. Zach Frazer has been confident. Donald Brown will get as many touches as the game dictates, even if it exceeds Edsall's ideal number of 25. I've been struggling to get over .500 this year. Seems that each week, I'm either 5-6 or 6-5. So last week, I sought advice from my neighbor, a rather grumpy senior citizen from Okinawa who never smiles, rarely speaks and spends most of his time trimming his Banzai trees. "Can you help train me for the challenge?" I asked as he attempted to catch a fly with a pair of chopsticks one afternoon. Ignoring my repeated requests, finally, he begrudgingly agreed. But not before proceeding to make me paint his house and his fence, sand his ridiculously large deck and wax his expansive collection of vintage World War II-era automobiles. Finally, I had enough. "What gives, Mr. Miyagi?" I asked, my arms so sore I could barely lift them. "Are you going to give me the secret to picking football winners or not?" The old man growled. "Your problem is, you pick games based on the best joke!" he yelled. "Too many jokes! You must concentrate!" Well, guess what? Last week I picked seven of 11 winners and finished tied for first place in the challenge with Kevin. Plus, those bullies from the neighborhood karate dojo stopped chasing me around on their dirt bikes. So, watch out. I'm feeling lucky. Game 1: Connecticut (-1.5) over RUTGERS - Vegas odds opened with the Scarlet Knights as 3.5-point faves. There was so much action, the line had swung 4 points the other way. Even as it stands, this one just seems too easy, like a Costanza game. Sticking with the Huskies, though. Game 2: Virginia Tech (+3) over BOSTON COLLEGE - I realize most UConn followers feel its sacrilegious to compliment "BCU", but quarterback Chris Crane looked pretty darn good against NC State. And did you see Matt Ryan light up the Bears last Sunday? He will be one of the NFL's top 5 quarterbacks within two years. Game 3: Syracuse (+23.5) over SOUTH FLORIDA - There is no Big East team dominant enough to cover a 23.5-point spread against anybody. Even the soon-to-be Steve Addazio-led Orange. 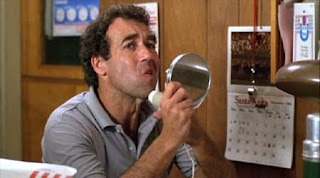 Game 4: Ole' Miss (+12.5) over ALABAMA - The basketball coach in "Teen Wolf" advised his team to live life according to three simple rules, which, 23 years after seeing the movie, I still adhere to. "Never get less than twelve hours sleep; never play cards with a guy who has the same first name as a city; and never get involved with a woman with a tattoo of a dagger on her body. Now you stick to that, and everything else is cream cheese." Genius. College football isn't exactly poker, but we can't go against Houston Nutt this season. Having "Teen Wolf" on your team makes a high school basketball coaches' job very, very easy. But the man gave some solid advice. Game 5: NAVY (+3) over Pittsburgh - Navy football fans screaming for Kaipo-Noa Kaheaku-Enhada to be the every down quarterback may get their wish Saturday. Bad news for Pitt. And the play-by-play guy. Game 6: MICHIGAN STATE (+3) over Ohio State - Big 10 Conference is down once again. Maybe it's time to stop the charade and finally change the name to the Big 11. Think of the marketing possibilities (and Spinal Tap references). "Most blokes stop at 10. 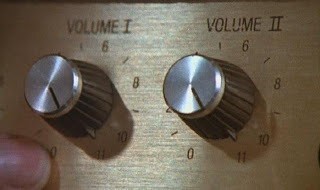 We go to 11." "Eleven! Exactly! It's one louder." Game 7: TEXAS (-5) over Missouri - Chase Daniel may have lost the game last weekend, but credit to Missouri's marketing department. Most schools have fairly lame Heisman campaigns. Postcards, a poster. Maybe a mini football. A couple of weeks ago, I received a package in the mail from Mizzou. 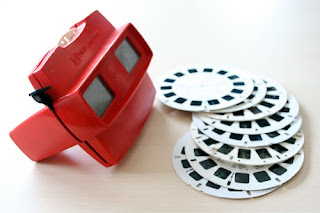 Opened it up to discover a John F. Kennedy-era View-Master machine, loaded up with a reel of Daniels action photos. Awesome. One of my favorite toys when I was a lad. And I won't lie. I got a little misty. Well done, Missouri marketing department. Well done. Game 8: VIRGINIA (+4.5) over North Carolina - Not sure what got into Virginia. We still don't think they're all that good a football team, but they got guts. (Bonus points if you can name the movie that quote is from. Hint: substitute "baseball" for "football"). Brandon Tate is done for the year, so we'll take the points. Game 9: PENN STATE (-23) over Michigan - John McCain had the cantankerous old man routine mastered during last night's debate, didn't he? All he needed was a pair of Mr. Magoo issue coke-bottle glasses and a cane, and he could have been Joe Paterno. Game 10: Middle Tennessee State (+14.5) over LOUISVILLE - Several members of a JV high school football team in Wisconsin got in trouble for relieving themselves in public during halftime of a recent game (The players thought the restroom was locked. It wasn't). It reminded me of a high school baseball teammate who had a similar problem before a road game early our senior year. About an hour before game time, he had to go. But the restroom was locked. So he found a wooded area behind the first base dugout and did what he had to do. He wound up getting three hits that game. A superstitious fellow, he made it his pregame routine to pee behind the field before every game. At North Haven, however, the brush and trees were a little thin. And the parking lot was only a few feet away. In the middle of his drainage, he looked up and saw a pair of horrified women staring at him from a parked car. Like only an 18-year old in mid-pee and with an excess of testosterone can do, he blurted, "What?!? You want some of this?" Turns out it the two women were our coach's wife and his elderly mother. Needless to say, that was the end of that superstition. I bring this up because said teammate wound up playing baseball at MTSU. So, there you go. Game 11 (our local special): Trinity (-7) over BOWDOIN - Surprise, surprise. The Bantams are undefeated. Again. Folks, the best all-around athletic program in New England (maybe the country) is tiny Trinity College in Hartford. Season ticket packages are available. Get your picks in by clicking the "comments" link below. I think someone just figured out how to embed pictures. As my inane banter increased, my win totals decreased. So this week assessment free picks! Seems like a lot o'HOME cooking on these picks...tailgating at the Church on River Road atRU this weekend...can't wait! UConn - Brown will run wild. If Frazer manages the game without any mistake, the Huskies win by 10...if he throws for 250 with a TD or 2, they win by 20. VaTech - As usual, I pick against the Eagles. Cuse - I just can't give up that many points in any Big East game this year, as dreadful as the Orange have been. Ole Miss - Too many points given to a team that recently won in the Swamp. Navy - I still think, after all is said and done, that Pitt will be Pitt. Michigan St. - Love the home dog. Texas - Brutal stretch for the Longhorns. It'll be tough to get through the remaining schedule unscathed. McCoy is my pick for Heisman to this poing. UNC - Although they've played much better recently, I still can't get over the memory of the beat down at The Rent. Penn St - Unlike the Big East, I feel comfy laying the 23 here. PSU will play for the national title. Big 10 has figured out the formula. The big boys play some soft home non-conf schedule, finish up the season around Thanksgiving, and let the carnage commence. Louisville - Toss up with this spread. Who knows? Guessing here. Trinity - Good news in this game is if anyone gets hurt, there are least 9 pre-med students on the field at all times. I'm out of the office today so i don't have time to harras you sniveling UConn swine. I'll deal with the West Haven crowd next week after I maintain my stranglehold on first place in this challenge. Big Donny Bertolotti from West Haven had a long day inside a septic tank abd then watchin our boys beat the living crap out Foran Milford high school, so he won't gloat about showing 'Staven vince what for last week, alright?